125 ml /80g/1/2 cup cherries (halved) You can use fresh, preserved, tinned or even dried cherries in this recipe. If using dried cherries, allow them to soak in boiling water before adding them to the recipe so they are nice and moist. Mix the flour and baking soda together in a bowl. Add in the beaten eggs, milk and vanilla and mix really well until you have a smooth, runny mixture. Add the mashed bananas into the wet mixture. Slowly add in the dry ingredients into the wet mixture, stirring constantly. Stir in the cherry halves and chopped walnuts. Spoon the mixture into your prepared loaf pan and bake at 350F/180C for around 1 hour 20 minutes. Cooking times may vary, so check if the loaf is ready by inserting a knife or toothpick into the center of the loaf. It should come out clean when the loaf is ready. When the loaf is cooked fully remove from the oven and allow to cool in the loaf pan before removing from the pan and placing on a wire cooling rack to cool fully. 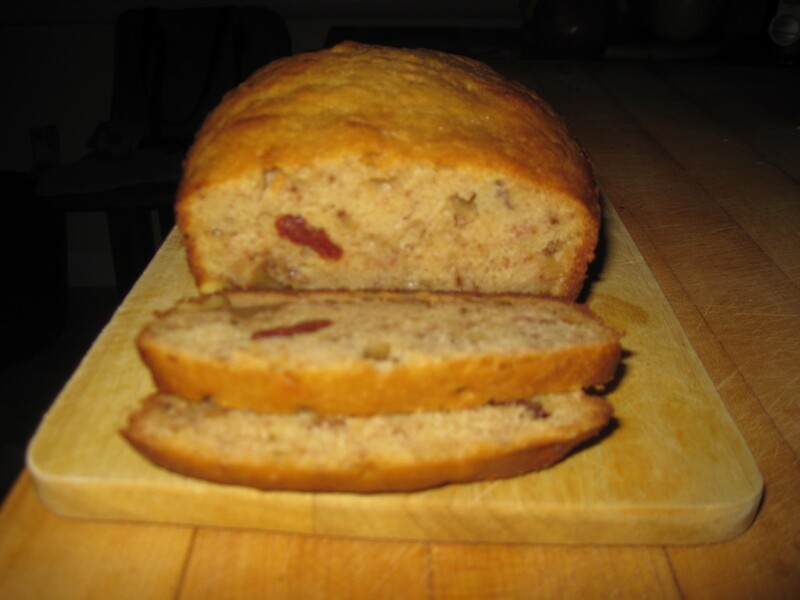 This entry was posted in Breads / Bochenki rozmaite and tagged banana. Bookmark the permalink.